Waiting for those last rays to slide under the clouds is always a good bet….lovely. In this case I wasn’t waiting for it, hadn’t even thought about it; it happened unexpectedly and I hurried to take advantage of the sudden opportunity, which I knew would be short-lived. I never get enough of that southwestern quadrant of the country. This is one place I’d gladly return to. It has its own kind of beauty, doesn’t it. Yes, and you know that kind of beauty so well from your years in Arizona. These landforms are fascinating, and I love how you have portrayed them here. You can imagine how happy I was to have these things as subjects, and you can imagine me moving around on the rocks to frame things in pleasing ways. Have you ever painted any landforms from our southwestern deserts? That would be quite a change from your Illinois fare. Yes, I can well imagine you moving about to get exactly the right shot. Your patience pays off, too. I painted a landform from Montana once, for my dad. Otherwise I prefer to stick to what I know and have a relationship with. When I travel I’m just a tourist. Although, our trip to the Carolinas was very inspiring. You may see some paintings come out of that. Okay, looking forward to those Carolina paintings. I know what you mean about feeling like a tourist in faraway places. I do have a much better grasp of what’s going on close to home. Nevertheless, the formations and landscapes in the west are so dramatic that, stranger or not, I jump right in and do what I can to record things. You do that everywhere you go, I think, and it has been an inspiration to me. My attitude is: take pictures first, try to identify and figure things out later. Happy inspiration! 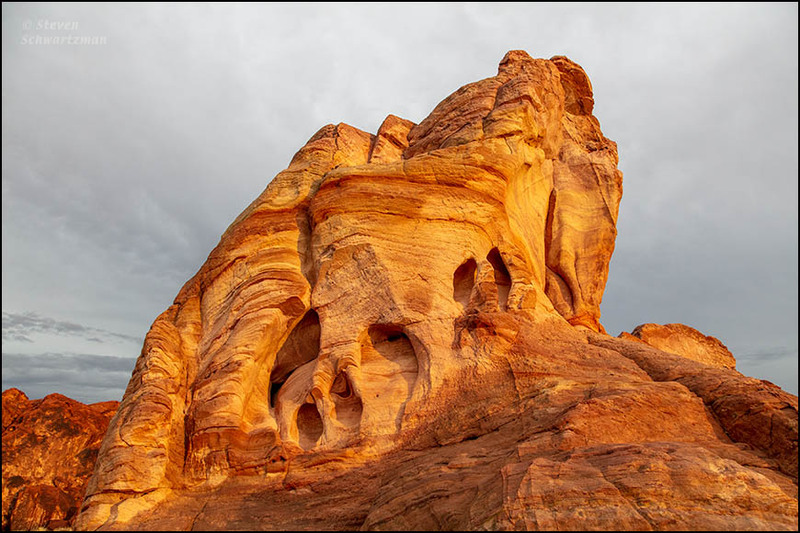 Wonderful shots, this deeply-eroded stone really conveys “ancientness.” The sandstone there really seems to soak up light, under that overcast, more like embers than fire, beautiful. 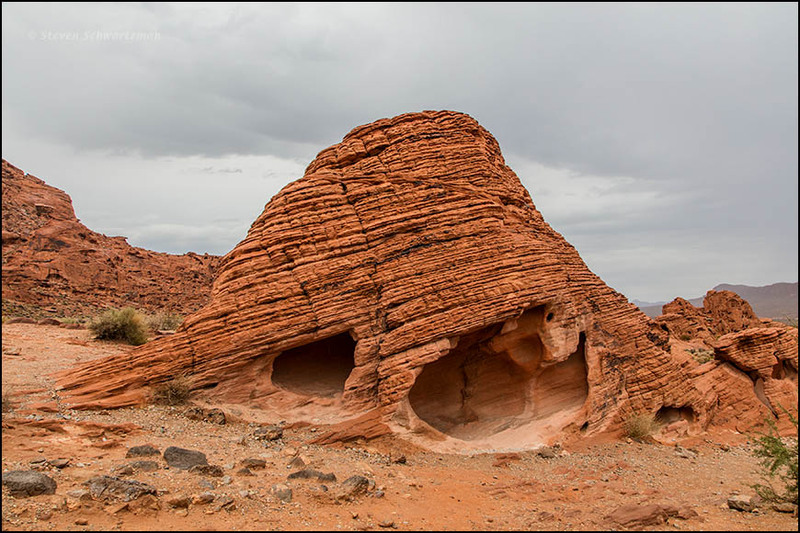 where the second picture is from Valley of Fire. While I initially resented the overcast and wished for blue skies to contrast with the warm colors of the rocks, I later figured the gray skies worked too, as you pointed out. Chances are that if I ever return I’ll get clear skies, which are the norm in the Nevada desert. I’ve sometimes found pebbles or rocks with that kind of honeycomb, around NY, but never big rock faces. Right. The large scale of the western formations is part of their appeal. Great post and pics! This is a place I would like to visit in the not too distant future. Thanks for sharing the info. You’re welcome for the sharing. I’m happy to let people know about this place. Colorado isn’t that far from Valley of Fire, relatively speaking, so I hope you make the trip soon. I hadn’t even heard of Valley of Fire before our trip, but it ended up being one of the highlights. 8 hours 39 minutes from Ridgway, CO … I could do that! Oh, if only I were that close Valley of Fire. Google says it’s about a 20-hour drive from Austin. You should go for it, especially with cooler temperatures settling in now. Late autumn is a great time to visit the Nevada desert. Those rock formations are astonishing, the one in the lower photo looks like a fabulous modern sculpture! It does, although I stretched “modern” back a century to Art Nouveau. The southwestern states are a wonderland of rock formations. The variety of textures in the first two photos is amazing. 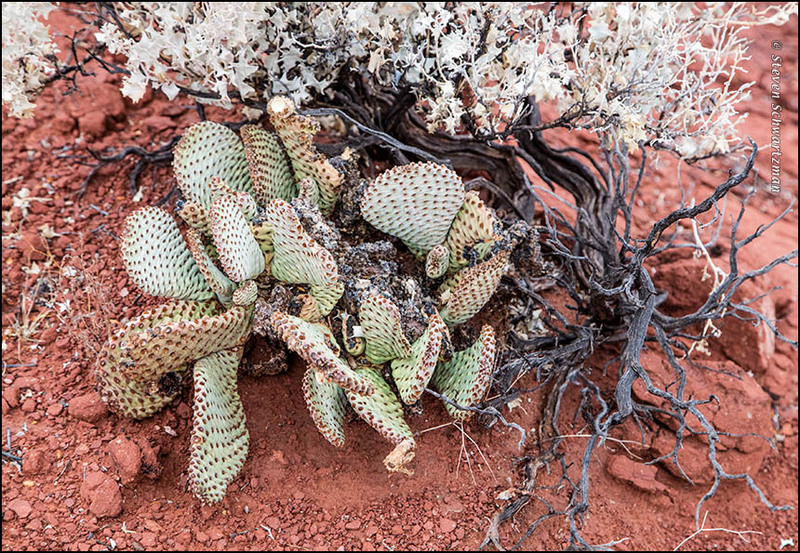 Even with a quick glance I found a dozen that were distinctive: eroded rock, cacti, tangled roots, clouds, and so forth. It’s clear that a person could spend a year there and not see it all: or a lifetime, for that matter. The last photo was evocative in a different way. No art nouveau castle or warm embers for me — at least, not until I can see past my own associations. Suffice it to say it brought to mind my first visit to a leprosarium in Liberia, and my first encounter with people whose faces had been disfigured in the way that I saw in the rock formation: particularly, the larger face with the missing nose. It’s rare that I have such a visceral reaction to a photo, but this one really did it: beauty and the beast, wrapped up in one glorious rockpile. Valley of Fire really is a photographer’s delight, so much so that I could’ve shown many more textures than the ones you see here, which were the fruits of less than a day at the site. I am fascinated by the geology in the western states. That beehive formation is very cool. My kids would have been all up in it ‘cause that’s what they do. Somebody missed an opportunity in naming a western state. Along with Montana (mountain) and Nevada (snow-covered) we should’ve had a Geologia. Oh well, a western state by any other name still offers geology galore, so I won’t complain. Yes, the beehives are cool. I suspect the authorities don’t want people climbing on them, but the park is large enough that rangers are rarely in evidence. Opuntia is such an odd genus. There must be many out there that have not been identified yet. You know how it is when we find something and want to key it out with information that is already documented, but it just does not work. You’re probably right that some Opuntia species out there are awaiting initial classification or reclassification. I’m a photographer, not a botanist, so I cut myself a lot slack when I can’t figure out what a plant is. Oh, I certainly do not intend to imply that you should know all of them. I do not know many at all, and I am supposed to. No, it’s okay, I didn’t infer that you thought I should know all those species. I’ve read that even botanists have trouble with some species complexes, goldenrod being one example. Botanists do not need to know either. Some sort of make it us as they go along, which is why we still do not know the species of the native blue elderberry, or even the red elderberry. Yes, I really lucked out when the setting sun briefly dipped below the clouds and lit everything up.